Like the identically named feature in Monument Valley, Wetherill Mesa, on the west side of Mesa Verde National Park, refers to Richard Wetherill (1855 - 1912), a noted archaeologist and explorer of Ancient Puebloan sites. 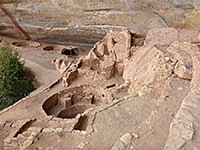 This area is open only between May and October, being closed by snow at other times, and it offers a much quieter visitor experience compared to the main group of ruins, at Chapin Mesa. The access road is especially narrow and winding, not suitable for vehicles over 25 feet, and it ends at a large parking area from where a tram used to take people along a continuation loop to several overlooks and trailheads, but this system was discontinued in 2015 due to contractual issues, so now the paved, 4.9 mile partial loop is only open to travelers on foot or bicycle. Next to the parking area are an information center and a seasonal cafe, and the place is still visited by several hundred people on busy days, though few see all of the ruins. There are five major ancient sites on Wetherill Mesa, one (Badger House) on top of the plateau, the others in alcoves below the rim. Of these four, one (Step House) is accessible by a self-guided trail, another (Long House) can be seen on guided tours or viewed from a overlook, while the other two (Nordenskiold Site 16 and Kodak House) are inaccessible, instead glimpsed only from viewpoints. The path to Step House is just north of the old tram road, while the others are along it, and all these can be seen either by short individual hikes, or together via a 5.2 mile loop. Map of Wetherill Mesa and the national park. 16 views of sites on Wetherill Mesa. The road to Wetherill Mesa forks off the route to Chapin Mesa at Far View Lodge, from where the parking area near Step House is 12.5 miles southwest. 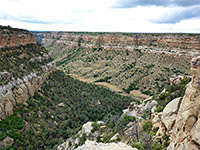 The first half of the road is even more bendy and narrow than the main route, curving in and out of nine steep-sided valleys, while generally running just below the crest of the great ridge that forms the northern edge of the mesas and canyons to the south. Many of the curves have 15 mph speed limits. Along this section are several viewpoints of the lowlands to the north and of the distant San Juan Mountains, before the road bends due south, straightens and runs along a narrow mesa, close to the west edge of the national park. It descends gradually and passes no more signed stops, just a few pull-outs for unmarked viewpoints, either along short paths or beside the road - most of these are of the East Fork of Rock Canyon, a large drainage in the adjacent Ute Mountain Reservation. The only destination for the majority of visitors to Wetherill Mesa is Step House, below the east side of the plateau, in a big, curving, east-facing alcove, not properly viewable from the rim and instead seen by a 0.8 mile loop path, which descends 90 feet. The trail heads east from the information building, runs along the rim a way then drops over the edge, down a series of stone steps before traversing back west to the ruins. The return route is through a couple of switchbacks up a bushy slope, then south, coming directly above the alcove, and back to the start. 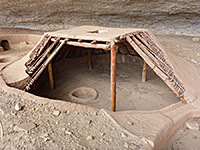 The settlement is rather small compared to some of the other major Mesa Verde sites, but similar in appearance, containing various kivas and rooms, a partly reconstructed pithouse and at least one petroglyph panel, the ancient designs seemingly mixed with more recent additions. A ranger is always present when the ruins are open, to answer questions and ensure regulations about not walking on the walls are followed. The next nearest cliff dwelling is named Nordenskiold Site 16, this being one of many locations studied by the Swedish archaeologist Gustaf Nordenskiold, in the 1890s. 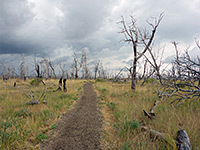 The shortest one-way hike from the parking area is 0.8 miles, initially along the old tram road, through land bearing scars of the 2000 Pony Fire (which burnt most of the pinyon-juniper forest on Wetherill Mesa), then on a path for the final 0.4 miles, a flat route over the mesa top, moving southwards to the tip of a short promontory, which has good views south down the lengthy drainage of Rock Canyon. Most of the path has a gravel surface, making for easy walking. 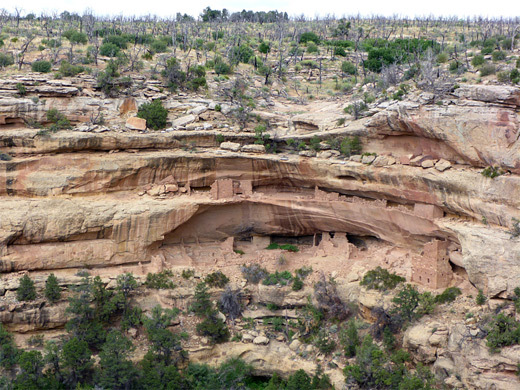 The 50-room pueblo is 140 feet east, in a two-level alcove in a continuous cliff face rather than at the head of a drainage as is more usually the case. The mesatop ruins are known collectively as the Badger House Community; four distinct sites, all broadly similar in appearance - low, excavated and partly restored dwellings, protected by metal canopies. The four are linked by a 0.9 mile loop, the start of which is 0.5 miles from the parking area. 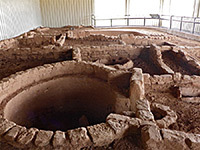 The first (northwestern) site is a small pithouse dating from about 650 AD, divided into two main sections, while the second, to the south, is the larger Pueblo Village from around 750 AD, centered on a great kiva, which has been incompletely excavated. Site three, close by to the east, is the actual Badger House, a similar though much later (13th century) village with a sizeable group of rooms including two kivas, one connected to the foundations of a tower via a 41 foot tunnel. The fourth site, to the northeast, is Twin Raven House, also quite large, consisting of various low-walled rooms and an unusually small kiva. 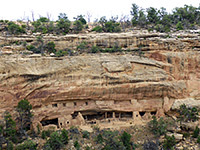 Long House, the second largest cliff dwelling in the park, can be entered on two hour, ranger-led tours, approaching via a 1.1 mile trail that descends the cliffs on the west side, or viewed from an overlook just off the old tram route. The shortest hike to the overlook from the parking area is 0.9 miles, partly on the road, partly on the trail; it is a quarter of a mile beyond the far side of the Badger House loop. The road is not as conducive to hiking as might be imagined, since the surface is rather rough. 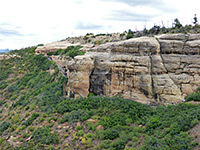 The viewpoint lies at the end of a short, twisting path to the west edge of the mesa, from where the ruins are 650 feet north, in an alcove, and contain one main group, with various kivas, rooms and towers, some parts accessed via a pair of modern ladders, plus a smaller, less accessible group on a thin ledge above. The southernmost site on Wetherill Mesa, not often visited, is Kodak House, seen from an overlook 0.9 miles beyond the Long House viewpoint (1.9 miles from the parking area); the latter part of the hike is all along the tram road apart from a very short path to the mesa edge. Like Long House, the ruins are in a south-facing alcove at the upper end of a short ravine, a tributary of Rock Canyon to the west. The site is also on two levels, the main section with a substantial tower to one side and an array of lesser rooms and kivas to the other. The settlement is named for a camera that was often left here by Gustaf Nordenskiold, when he was away working on other ruins in the vicinity. The overlook is almost at the south end of the loop road, so the return route can be in either direction. The far (eastern) side of the road crosses briefly into a patch of old-growth woodland, not burnt by the wildfire that affected other areas, then runs north over flat, mostly grassy land, back towards Badger House. Another path (the Rock Spring Trail) branches off to the south, marked by a 'No Entry' warning notice, this being one of the numerous backcountry routes in the park which are now closed to all unaccompanied hikers; along here are many other small, mesatop ruins, the majority beyond the park boundary, in the neighboring Indian reservation.